Hollywood films and BBC TV shows to be streamed on Facebook | What Hi-Fi? Facebook users will soon be able to watch films and selected TV programmes on the social network site. Miramax, the Hollywood film studio, has announced that it plans to allow users of Facebook the opportunity to rent films including Kill Bill, Cold Mountain and Good Will Hunting. From September, you'll be able to pay around $3 (£1.80) or 30 Facebook credits for selected films to be streamed to your computer. At the same time, BBC Worldwide has announced that it will sell episodes of Top Gear on Facebook for 93p each, or 15 Facebook credits. 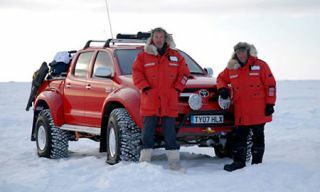 The commercial arm of the Beeb is initially offering three episodes – the Polar Special, US Road Trip and Vietnam Road Trip – on Facebook. Once rented, episodes will be available to view for 48 hours. Facebook has about 700 million users globally, but the Top Gear episodes will only be made available for users in Europe, the US, Australia, Canada and New Zealand. Last month BBC Worldwide struck a similar deal with Facebook to allow fans to watch classic episodes of Dr Who.